There are times with an unpleasant situation can arise that calls for flowers. Fresh flower delivery is not only for happy or cheerful occasions, but to lift the recipients spirits. Nothing says get well soon like a Get well flower delivery. When you send fresh flowers for a hospital ward, it will automatically brighten up the atmosphere for the patients who are being treated there. When someone is ill and has been admitted to a hospital, flowers can make all the difference in the world to their outlook. Fresh flowers have the ability to generate cheer and hope in a person’s life. Life can be chocked full of many ups and downs. And when you’re sick, it seems that life can be going downhill. Delivering a fresh floral bouquet to your loved ones lets them know you are thinking of them and wishing them a speedy recovery. No matter if it is someone who is in recovery or at home in bed, flowers will truly lift their spirits. Sending flowers is like sending a bouquet of cheer. Flowers are beautiful to look at and they are a great conversation piece to get the recipients mind off their illness. Flowers can be arranged in a bouquet in a vase, basket, or a wreath style setting, all of which are just perfect for a hospital room. When you Send get well flowers to your loved one in hospital it will no doubt be a wonderful surprise. You can brighten up someone’s day just by sending flowers to them and it’s even more special when that person is feeling under the weather. 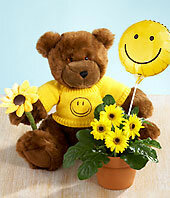 You can even add in teddy bears, chocolates or even balloons to make the gift even more special. When you order bright coloured floral bouquets it is sure to bring about smiles from anyone who is feeling down. 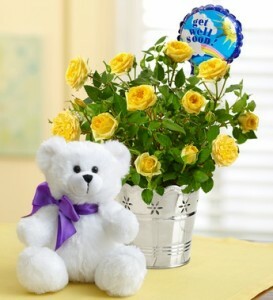 Pink and yellow flowers are a popular choice when you want to send a message that offers a speedy recovery. When you want to wish someone sentiments of get well, the most popular flowers to choose are carnations, calla lilies, daisies, or freesias. You can often find these flowers in most bouquets and arrangements. As florists, we are able to guide you into making the proper choices to fit the occasion they are wanting use them for. Floral arrangements are a great way to show someone you really care. 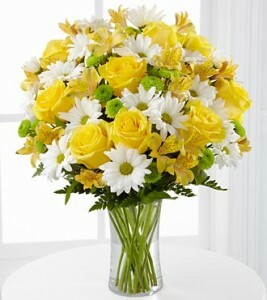 When you order your bouquet from a professional florist, you will receive a quality bouquet at a great price. Our website offers lots of information to help you choose the perfect bouquet to convey your sentiments. Flowers can be delivered in almost anywhere. In cases where the ward in the hospital doesn’t allow visitors, the flowers can be left with the staff to pass along to the patient.